Kyle was born in Burford, Ontario, and raised in both Burford and Belleville. Kyle attended the University of Guelph where he majored in Human Resources Management and received an Honours Bachelor of Commerce degree, with distinction, in 2007. He graduated from the Faculty of Law at the University of Windsor in 2010 and was called to the bar in 2011. 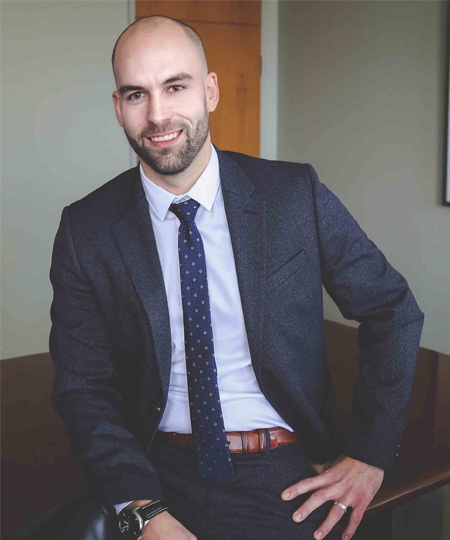 Kyle summered with Giffen LLP in 2008 and 2009 and completed his articling term here in 2011. Kyle became a partner at Giffen in 2016. He is a member of the Canadian Bar Association, the Waterloo Law Association, and a former member of the Waterloo-Wellington Estate Planning Council and Big Brothers Big Sisters of Guelph. Kyle currently sits on the Board of Directors for both the Downtown Kitchener BIA, and for KW Counselling Services. Kyle lives in Kitchener with his wife (local artist Kailey Hawthorn), with their two children. In his spare time, he enjoys fishing, playing hockey, golf and camping. Real Estate Law (including residential purchase and sale transactions, mortgages, commercial and residential leases, tenancy issues), Estate Planning (including Wills, powers of attorney and estate administration matters), Employment Law (including wrongful dismissal, constructive dismissal and employment contracts), Corporate Law (including share purchase and asset purchase agreements, incorporations and re-organizations).